These students really say it best. In fourth grade students are challenged to learn about where they come from, read a variety of books that match and challenge their reading level, and learn multiplication and long division. Mr. Bird, Mrs. TerHaar and Mrs. Jacobs also try to foster lasting friendships rooted in the love of Jesus. The use of laptops and iPads also create an unlimited amount of tools to help the students answer questions they are investigating. Read to Self, Work on Writing, and Read to Someone are three of the Daily 5 framework areas that are used in fourth grade. Students read Good Fit Books in the following genres: Fantasy, Folk Tales, Non-fiction, Poetry, Legends, Mystery, Realistic Fiction, and Biographies. Mini-lessons are taught using CAFE skills that correlate with each genres. Some of the highlights of the fourth grade reading curriculum include reading Michigan legends, literature circles with realistic fiction texts, and a wax museum presentation with biographies. In fourth grade students learn about types of sentences and parts of speech. Nouns, Verbs, Adjectives, Adverbs, and Pronouns are the five major units. Students are engaged with English concepts by singing jingles and practicing their skills in writing. Students learn how to write good leads, descriptive details, and endings. They will publish a piece of their writing in each of the following areas: personal narrative, poetry, and research reports. We use Scholastic News for current events and cross-curricular topics. Fourth graders explore the history of Michigan from the Native Americans, explorers, settlers, Civil War soldiers, World War Two supporters, to the citizens today. They also learn the geography, government structure, symbols, and natural resources of our Great Lakes State! 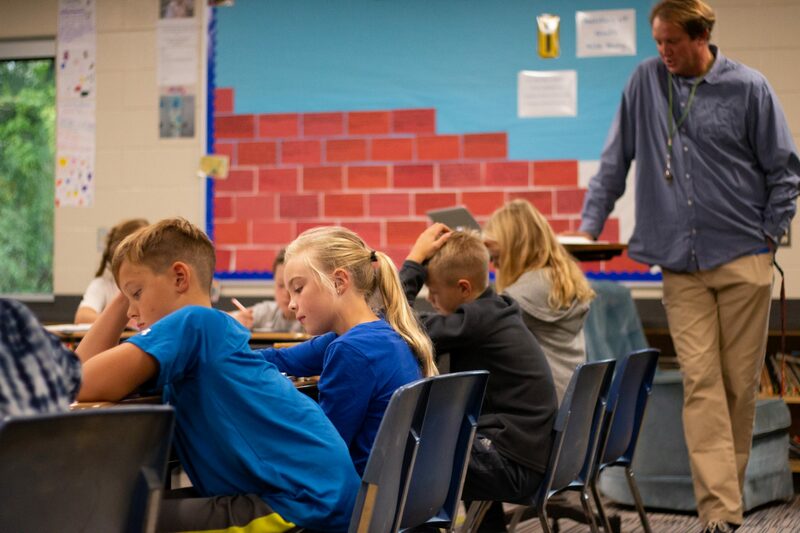 The fourth grade curriculum briefly reviews the Old Testament lessons taught in third grade before beginning a study of Israel from the time of the judges until Israel’s exile. These units show students numerous examples of God’s faithfulness to His people. This in-depth study of the Bible begins with two flexible units: a study of Paul’s epistle to the Philippians and a unit on the writing of the Bible. This unit concentrates on heat, magnetism and electricity as energy transfers. The interaction of magnetic materials is explored through investigation. Students explore electrical circuits and apply their knowledge to build an electromagnet.